Professor at the EEE Department of BUET, Celia Shahnaz is a senior member of The Institute of Electrical and Electronics Engineers (IEEE) and a fellow member of Institution of Engineers, Bangladesh (IEB). IEEE, which describes itself as “the world’s largest technical and professional organization dedicated to advancing technology for the benefit of humanity” has 10 IEEE regions; Asia Pacific Region 10, Region 1 to 6 in USA, Region 7 Canada, Region 8 Africa and Middle East and Europe and Region 9 is South America. IEEE has active presence in Bangladesh and carries out various professional networking activities, providing Bangladeshi Engineers and professionals a potent platform for connecting to their peers from across the world. Prof Shahnaz became the Communications Chair of IEEE Special Interest group on humanitarian Technology (SIGHT) Steering committee, as well as Chair of the IEEE Global Women in Engineering (WIE) Workshops sub-committee and Regional Representative of IEEE Power and Energy Society (PES) Women in Power Region 10 (Asia-Pacific), among holding other important positions with the international organizations. She is the founder of WIE of IEEE Bangladesh Section. 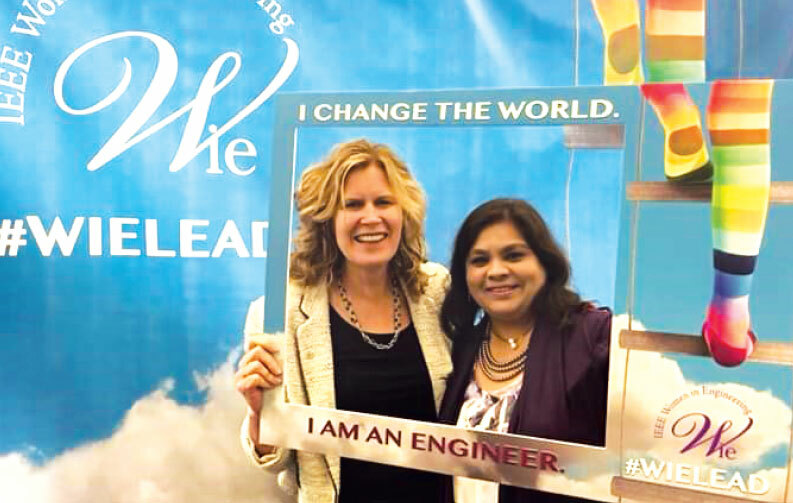 Under her leadership, in October 2018, IEEE Women in Engineering (WIE) International Leadership Summit (ILS) was held in Dhaka with prominent international figures in the field attending the event, in particular around 55 speakers including 13 foreign speakers from 8 different countries, namely USA, Canada, Malaysia, Singapore, Indonesia, India, Srilanka, and Bangladesh with more than 300 delegates. She is serving as the 2018-19 Chair of IEEE Bangladesh Section, the first female Chair in the 25 years’ history of Bangladesh section since its inception in 1993. Prof Shahnaz spoke with Fintech for an interview to talk about her research, her work with the organization IEEE, Bangladeshi women in engineering profession, among various other topics. Could you talk a little bit about your background please? How you began your career and what led you here? I am serving currently as a professor at the EEE department of Bangladesh University of Engineering and Technology (BUET). I am the first PhD holder to return home to serve in the department of EEE and also in the history of 65 years of the department of EEE, I am the first female professor here. It is a big responsibility and commitment. I like to see myself as a researcher and innovator. My important research areas include signal processing, speech recognition, audio visual emotion recognition, speech enhancement for hearing impaired people, pattern recognition, machine learning and artificial intelligence for speech, audio, video, image and biological signals, such as ECG (cardiac signal), EEG (brain signal), seizure detection, brain tumor segmentation from magnetic resonance Imaging (MRI), breast cancer detection from mammogram images, skin disease classification from digital images, , IOT and robotics for industrial automation. But nowadays, following the trend in research internationally, I started along with my team to apply deep neural network, convolutional neural network for different application areas that I mentioned. For autistic and disabled people, I have developed many technologies with my research team to make them capable of being adaptive in the society and employable in industry. So, there are numerous research areas where I expanded my interest to the match the mission and vision of the 4th industrial revolution (4IR). I have been awarded Bangladesh academy of science (BAS) gold medal for my contribution in science and technology in Bangladesh. My students are doing very commendable works. Apart from two PhD students that I have currently supervising, a number of students (13) have completed their Masters researches under my supervision, because of their work in the Masters degree, most of them are now accepted in the PhD programs in the renowned USA universities , such as Texas A& M university, Cornell University, University of California Riverside, Vanderbilt university, Case Western Reserve University and some are doing jobs in the companies like INTEL, ABB after completion of their PhDs . These are remarkable institutions. As an academician, my satisfaction is to be able to see my hard work implemented through my students’ achievements. Tell us about IEEE’s activities in Bangladesh. What is your main focus and how do you pursue that? I started connecting with IEEE since my undergraduate life at BUET around 1995. When I was doing my Masters degree at BUET, I wrote a research paper which was accepted in a flagship conference of IEEE circuits and Systems society (ISCAS) to be held at Bangkok, Thailand in 2002. I participated in that flagship conference to present the research paper with a reduced registration fee as an IEEE student member and that transformed my vision about IEEE. I felt more interested about it when I saw the pioneering authors whose papers I used to cite as a reference, I was able to see them in front of me, I could connect with them, interact with them. That actually propelled me to be involved more with IEEE. Now, IEEE is a passion for me. As a Canadian Commonwealth Scholar, I went for my PhD study at Concordia University in Montreal, Canada and during my PhD life at Montreal, I was involved with all the IEEE events, graduate seminars, tutorials, the intra-university activities, inter university activities, conference volunteering, continuing education programs and open house. I felt that I was just enjoying the benefit of IEEE through networking with people, learning from people. While I was attending the Montreal section women in engineering inaugural activities, that was the first time I started thinking about how I will contribute to the technical society around me. So, with that vision when I returned BUET after completing my PhD in 2010, the very first thing what I did was I submitted a petition for forming a WIE group in Bangladesh, and that was actually a life-changing decision for me. Then IEEE Bangladesh Section Chair Professor Harun-ur-Rashid, I remember gratefully, supported me for forming this group. I also started serving as the membership development coordinator of the IEEE Bangladesh section executive committee in 2012. I took some innovative membership drives that brought a significant increase in the membership. It was because the initiatives reached beyond women and everyone was interested. It was a challenge before because of lack of knowledge about the benefits and impact of IEEE among the young students and professionals. I led organizing workshops on various areas for skill development of female students, like PDB design workshop, LATEX, graphic design, Spice simulation, MATLAB programming etc. This helped grow confidence among female students and made them technically more skilled than others who were not participating. I had a vision to spread these activities to entire Bangladesh and I have launched collaborative events involving Bangladesh section, WIE of Bangladesh and different universities. In the long run, it encouraged IEEE student branch formation in those universities which now exists in more than 40 universities and eventually led to from women engineering group under that IEEE student branch. From IEEE Region 10, we won grant to organize the first women in engineering congress in Bangladesh in 2013, I moved beyond BUET to hold the event at Ahsanullah Science and Technology University, it was a huge success. In that year I received the women in engineering IEEE Region 10 Outstanding professional volunteer award. In 2015, I submitted nomination for our WIE group to global IEEE WIE, and we received honorable mention for the Women in Engineering Affiliate Group of the year award. I also received the 2015 Women in Engineering Inspiring Member of the Year Award from global IEEE WIE. In 2016, our WIE group won the best group award in Region 10 and received Women in Engineering Affiliate Group of the year award in 2017 from the global IEEE WIE. I have directly mentored to form more than 16 WIE student branches in Bangladesh. Among them, BUET WIE student branch, whose I serve as an advisor, has received 2018 Region 10 best WIE student branch award and honourable mention for the 2108 WIE student branch Affinity group of the year award from the global IEEE WIE. I was the founder of IEEE WIECON-ECE in 2015 at Dhaka, Bangladesh, the first women in engineering conference in the area of electrical and computer Engineering in the world, it became a mega success, in 2016 I was chosen as the women in engineering coordinator (Chair) for the whole IEEE region 10 (Asia Pacific), the Bangladeshi to occupy a coordinator position in R10. Due to my IEEE contributions in section and Region, I became the recipient of 2016 Member and geographic activities (MGA) leadership award, the first Bangladeshi to win such an MGA level award. I founded the SIGHT group FLASH in Bangladesh Section and started humanitarian technology based activities for the local community along with my team, that helped Bangladesh section to win the bid to hold a flagship conference from Region 10; Region 10 Humanitarian Technology Conference (HTC 2017) at Dhaka, where I served as general Co-chair, played one of the key roles to receive its tremendous success. In 2015, 16 and 17, the membership growth has been recognized by our entire global IEEE. We received outstanding membership recruitment performance recognition three years in a row. In 2018, under my leadership as a Chair, IEEE Bangladesh Section have had three remarkable achievements: one is our membership retention recognition, membership recruitment and retention recognition and the best recognition possible for our section is 2018 MGA outstanding large section award. Also, in 2018, I led a bid submission and won IEEE TENSYMP 2020, the second largest flagship conference of Region 10. As the general Chair of IEEE TENSYMP 2020, it is a great honour for me to bring the best possible opportunities for students, researchers, young professionals, industry experts and entrepreneurs in Bangladesh. Academically ambitious Bangladeshi students often go to foreign universities to pursue higher degrees and even a career. Why Bangladeshi universities aren’t progressing to become better research universities with international standards? I do not agree with this. As I mentioned, majority of the students who completed Masters degree under my supervision, are doing research in high ranked universities of USA. This is a clear attestation that our research has been accepted, they did world class research here at BUET. Yes, funding opportunities are limited compared to foreign universities, compared to even India, but opportunities have developed in recent years. Previously, we used to receive very little funding but now University Grants Commission is providing more funds, maybe it is not huge but they have started. Also, the ICT Division and Science and technology ministry have some funds, maybe it is not enough to support all the needs for all universities but they have begun. We need to create a common opinion to create more opportunities for research and innovation. IEEE Bangladesh section has worked hard with the Library Consortium and UGC to make its research papers available to Bangladeshi universities. Since 2016 a number of universities acquired subscription, enabling the students to access academic papers the IEEE Explore. BUET has a significant number of women students. Are more women coming into engineering degrees than before? What is ahead for IEEE Bangladesh? In 2017 and 18, Professor Fattah from BUET (Past Chair of IEEE Bangladesh section) and myself along with our graduate students formed four societies. Forming four technical societies in one or two year is an achievement. We want to launch many other societies to help Bangladesh research community to get a global standard and platform. In 2018, I have conceptualized, our team submitted proposal and got approved a project aiming to supply clean water for the Rohingya refugees in the camps, using a technology that we will develop by ourselves. So this Rohingya project is one of the remarkable achievements of 2018 which is directly related to the distressed people. Through IEEE, we want to work for the underserved community, such as for people who are living in the Hill Tracts, Rangamati, islands and disaster prone areas. In 2018, under the leadership of professor Fattah, another important achievement is receiving a big grant from the IEEE Foundation to demystify neuclear energy education program in Bangladesh. Our section has already conducted more than 13 events in different universities. IEEE Bangladesh section received the highest recognition, but in the long run we need to make the growth and glory sustainable. We have grown because of some visionary leaders and countless passionate volunteers. In 2018, as Chair, I led more than 120 events, this momentum has to be continued.